Fall has to be my favorite season for baking. With Halloween, Thanksgiving, and Christmas all near each other, the amounts of baking that occurs in my house is endless! Although I have to admit, I took it easy this year as far as Halloween goes, since we opted to go to Disney instead of really having a party. Every year at work we have a Thanksgiving luncheon, as well as a charity bake sale. Cakepops have been such a hit with my friends and coworkers so I usually make those for both our luncheon and the bake sale. 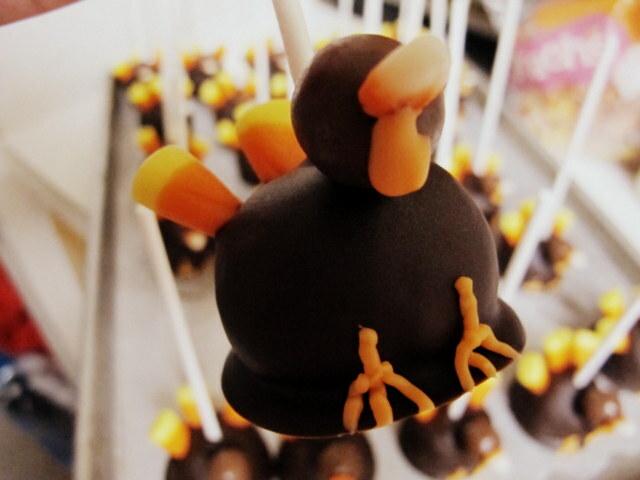 I usually make pumpkin flavored pumpkin cakepops, which I of course did this year, but I also added on some cute turkey cakepops! The main integral structure of the cakepops remains identical (unless you decide to do something that isn’t spherical), and only differs when it comes to decoration, so once you know the basics, the possibilities are endless : )! To begin, bake your cake and let it cool completely. 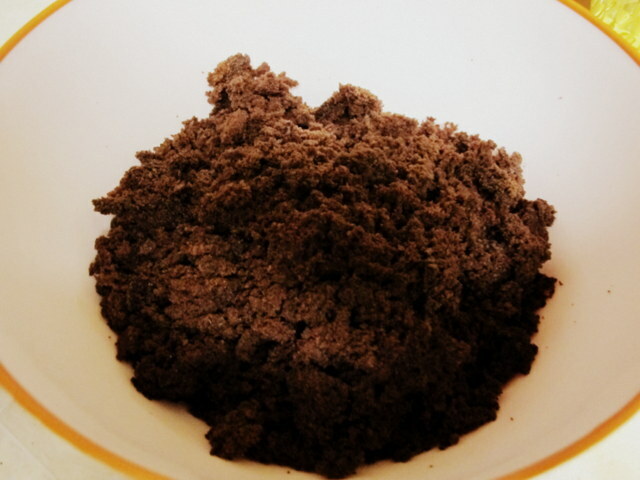 After it’s cooled, remove all the edges of the cake and crumble the cake into a bowl. To this add your frosting. You should put just enough frosting so that you can make a firm mixture, you don’t want this to be too soft! If the mixture is too moist you’ll end up having a very difficult time dipping the pops into chocolate without them sliding off the sticks! If you’re using a cake mix and canned frosting, I’d recommend a bit less than half a can of frosting to one cake mix. Line a cookie sheet with some wax paper. 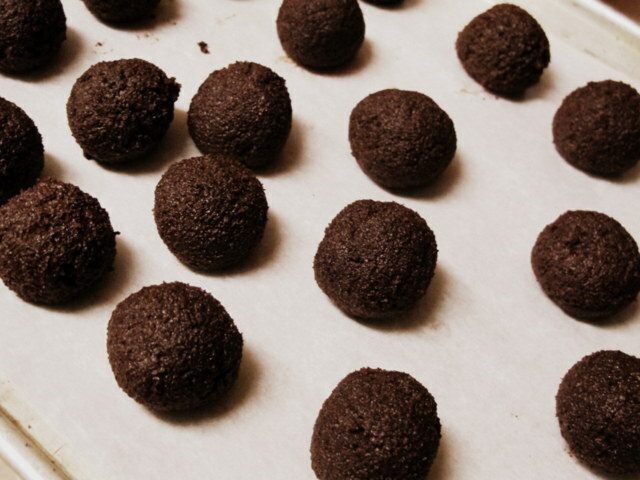 Take your mixture and roll into little balls and place them on the cookie sheet. Allow cake balls to cool in the fridge for at least 10 minutes. 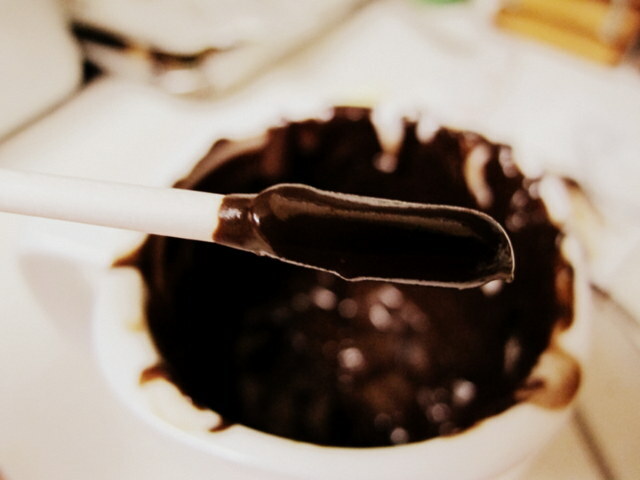 In the mean time, prepare your chocolate by melting in 15 second increments. 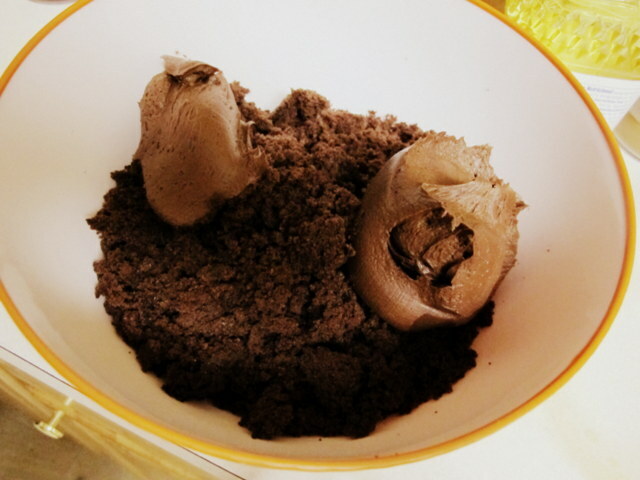 You never want to microwave chocolate for too long, or you may risk burning it! Add shortening along the way to thin the chocolate out. 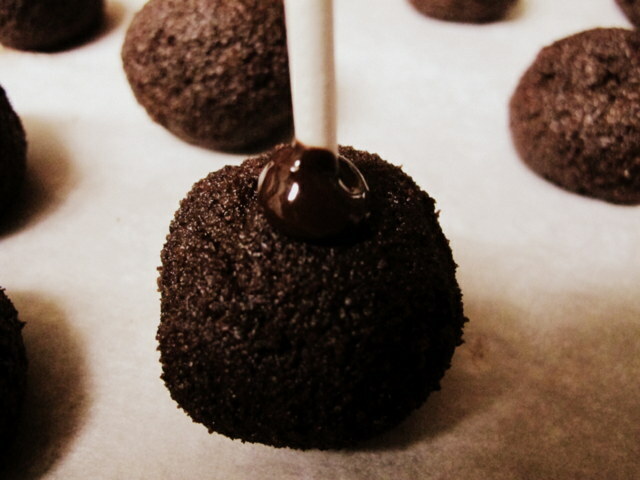 If the chocolate is to thick, your cake pops won’t have a smooth surface. I usually use about 2-4 tablespoons of shortening. Take your lollipop sticks and dip just the ends. 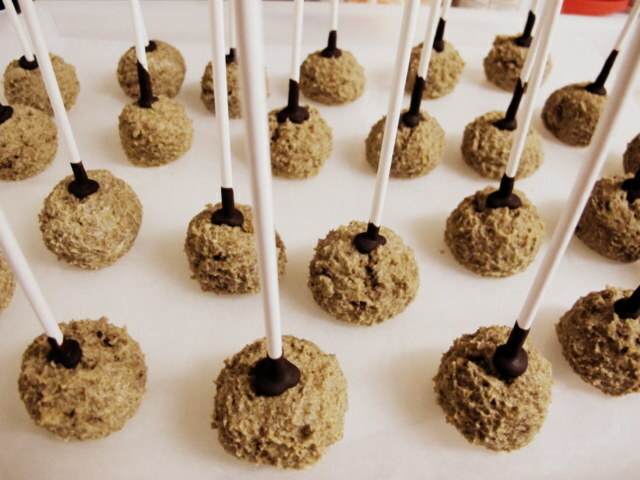 Dip these ends into the cold cake balls and return to the fridge to set for about 10 minutes. 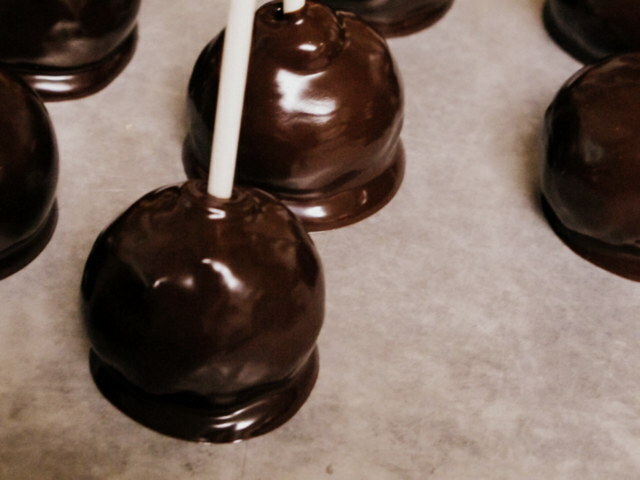 Once the sticks have set, dip your cake balls into the chocolate, allowing for any excess chocolate to drip off before setting back onto the wax paper. Before placing them into the fridge allow them to set slightly at room temperature. 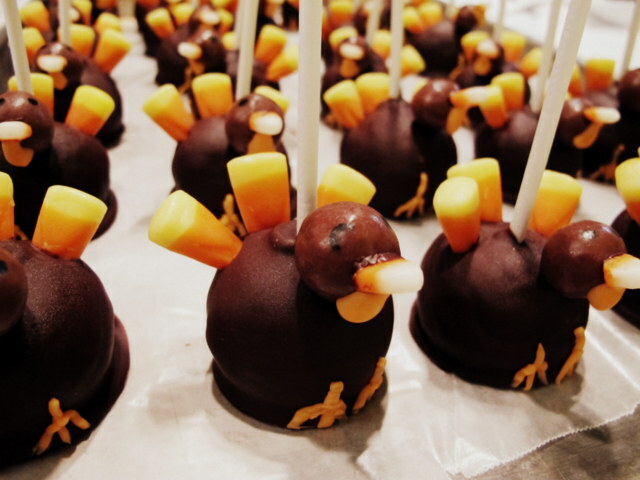 At this point take three candy corns and place them on the back of the cake pop to make the turkey’s feather. 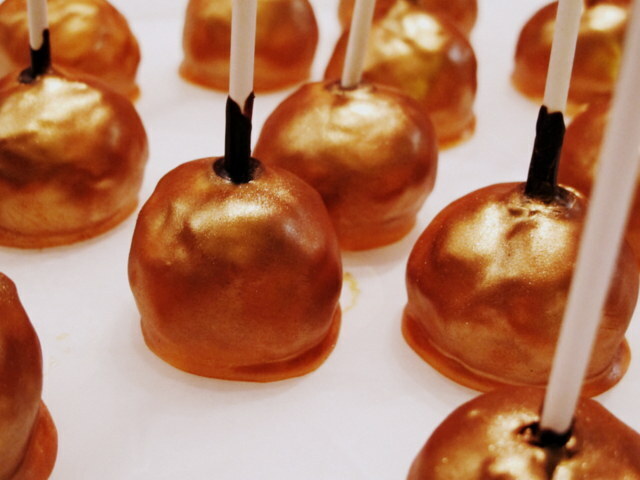 Place cakepops in the fridge for 15 minutes to set completely. 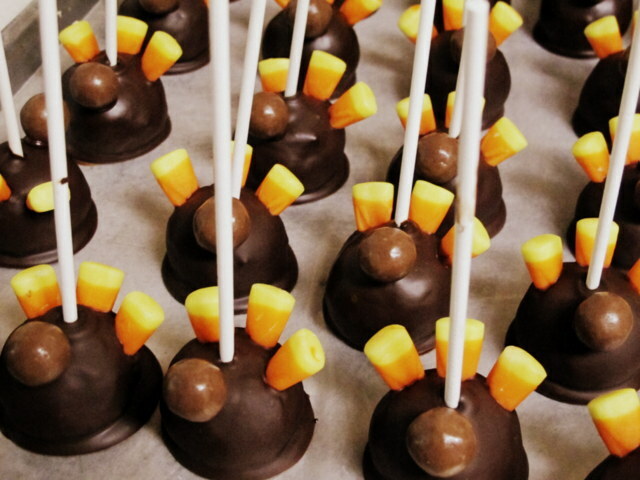 While you let the cakepops set, take some candy corn and cut the tips off, these will be the beaks on our turkey! Once the turkeys have set, take them out of the fridge. Using some left over chocolate attach the malt ball heads. Allow this to set in the fridge. 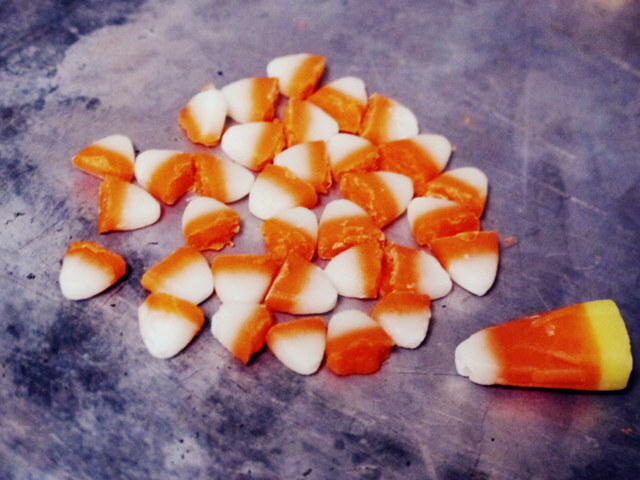 Once set, attach the candy corn beak using some chocolate. Allow the cakepops to set once again before continuing. Take a bit of chocolate (I chose orange candy melts) and draw on the Turkey’s legs and waddle, lastly take your marker or your black candy melts and draw on some eyes! Let the cakepops set in the fridge a final time before packaging them up! 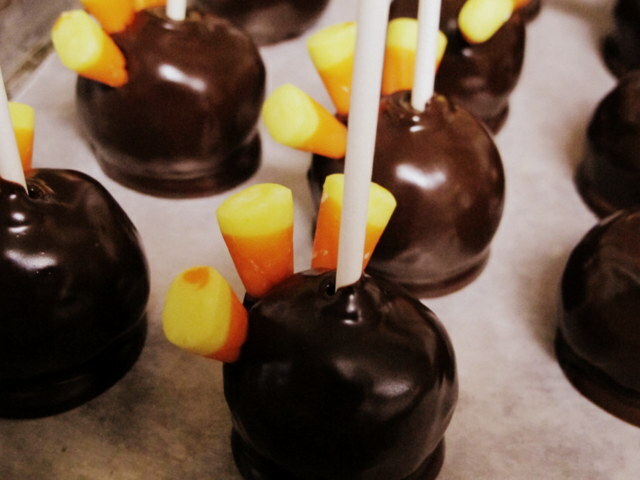 For the pumpkins, follow the same basic steps except dip the cakepops in orange candy melts (to which I also added shortening). You’ll notice that I dipped the sticks a little more in chocolate than I did with the turkey’s, this is to imitate the stem of the pumpkin : ). Once they’ve set in the fridge I took a fluffy brush and some bronze luster dust and dusted each of the pumpkins. 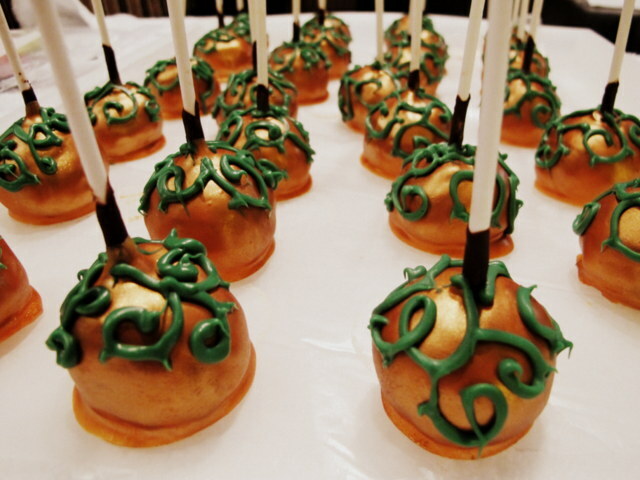 Lastly using some green candy melts, decorate your pumpkins with some cute leaves! Normally I would want to dust the leaves/vines with green luster dust, but I couldn’t find my little jar, so I just left them as is. To transport them I put each one in a little plastic bag, and tied them with a ribbon : ). I realized I really should have taken more pictures for this tutorial, so I’ll make a note to take more descriptive photos on my next cakepop adventure : ). Thankfully these were a huge hit at work! We were able to sell out of them fairly quickly at our bake sale too, which was great : )! Also, I know that Thanksgiving is over, and we’re moving into Christmas season, but I just wanted to share some cute cupcakes I made to go along with the cakepops! These were so quick and simple to make! 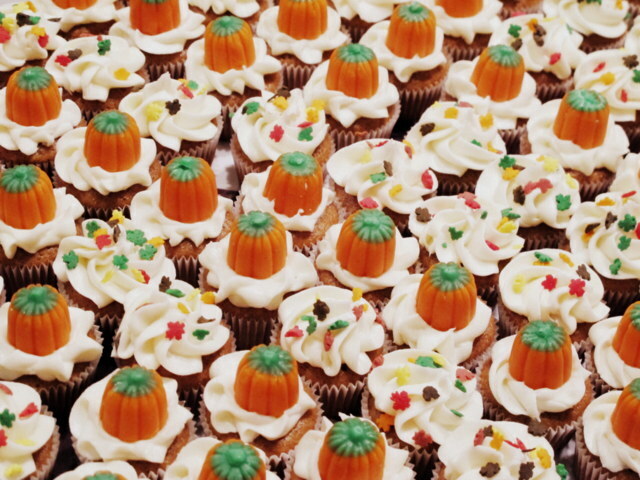 These are just mini pumpkin cupcakes, with candy corn pumpkins and sprinkles for decorations. The only difficulty I had was finding the pumpkin candy corn (which I’m a big fan of btw). It was mainly difficult because this idea didn’t occur to me till after Halloween. Thankfully after dragging my best friend on a candy corn finding expedition, we dug out two bags of these pumpkins from a huge bin of candy corn at Target lol! Well, I know this post is a little late since Fall is practically over and Winter is coming (I’ve been reading too much game of throne…), but better late than never!